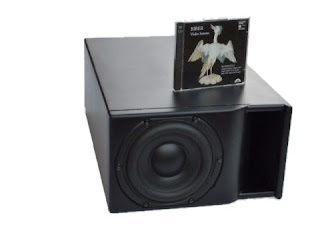 The Compact Subwoofer Technology is a design method for small horn subwoofers, presented in the article available on the Kvålsvoll Design web pages. The article describes briefly what it is, and how it works, read the entire article there, it is also available for download as .pdf file. designs, and give some examples on what can be achieved, in real subwoofers. The 6.14 subwoofer. A very compact 30Hz, 100dB design. bass in a larger or even medium sized room with the physical authority and feel that larger systems have. However, the small size have some advantages, and the output is enough for low and mid volume tv or movie, and music. With two of them in a small room they played loud enough to have a gentle physical impact on the cannons in the Master & Commander movie. Being small and nice looking, it is easy to find a place for them, they will also often fit under a sofa. Another advantage of small size is that they are easier to move around for measurements and testing. Utilizing a small 6.5" driver, this design really pushes the limit for output from such a small woofer. 30Hz extension is not enough to get the solid weight of low frequency effects in movies, and nowadays there are lots of music that also benefit from extension down to below 20Hz. The difference really has to be experienced. 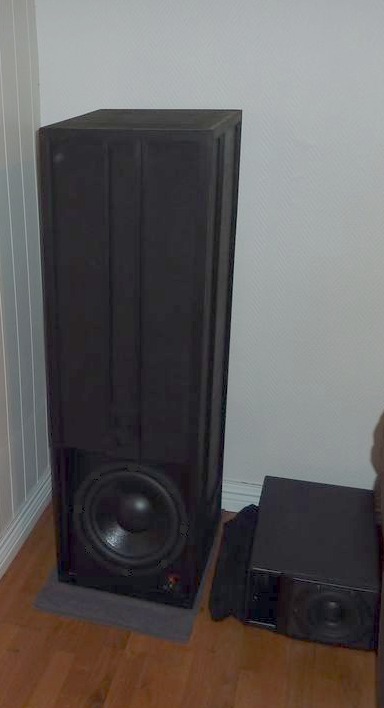 The T138 (left) is a real subwoofer with true 20Hz capacity. As we can see, it comes with a price. Now, compare the size of the 6-14 to the T138. This is a real subwoofer. Extension to well below 20Hz, design output 112dB/1m/2pi at 20Hz. Even though the compact subwoofer technology enables very good performance for the size, it still can not beat the physics of low frequency sound reproduction. More output at lower frequencies will still require a larger box. How much output does one need, then. We see that maximum sub output may actually be 124dB. However, we can make some assumptions that lowers this number considerably. First, it is unlikely that there is full level content at 20Hz and below. And, if there are any other sounds playing at the same time in the front and surround channels, some of the headroom is used for that signal, and thus can not have low output at maximum. For most of the time, we can assume it may not be necessary having more than 115dB capability. But, since we would like to have some reserve headroom for a nice house-curve with some boost down at the lowest frequencies, that must be added. We still end up with 115dB + 6dB = 121dB. To achieve this kind of output will require some powerful subwoofers. 4 decent subwoofers is no overkill..
Simulations of the S4 subwoofer, a nice, 62l net volume/97l external design, shows output capability at 108dB/20Hz/1m. Around half the size of the T138 pictured above. Also consider that the output increases some up in the mid-bass range. This should be a good start for a nice subwoofer setup. We see that using a driver with similar parameters in sealed boxes requires 10 subwoofers, and that is not really practical. (For sealed simulation: mms increased to 2x, mounted in 50l sealed enclosure, driven at same voltage level, excursion xmax = 16.8mm). An alternative could be to use larger vented boxes, but bigger boxes are more difficult to place, likely it is easier to find space for four smaller boxes than one or two monster-cabinets. There is another advantage to using several smaller subwoofers as well - when located spread around the room they tend to even out the frequency response. But that is a different subject on its own, so we can get back to that later some time.